I’ve been working for years with Django and I really appreciate it. But one thing I never understood is why there is nothing “builtin” to run a suite of tests without any database handling. So I travelled the Internet to find a solution and so was it : I have to write my own Test runner … and that what I did. For these two reasons, in development, we run unit tests far more often than integration ones. To be able to do that we need a way to determine if a given test is a integration one or a unit one. Django does, in fact, provide a way to distinct unit test from integration test. Indeed, it allows us to override two different classes depending on what we need. SimpleTestCase don’t bother to use transactions and rollback any database modifications between tests. It is the most basic TestCase class provided by Django. Fine, but how do you run tests ? python manage.py test will work but all tests will be run including unit tests. We need a way to run only unit tests to get rid of database handling and gain a (potentially) huge amount of time (think about the time needed just to create the test database if you have 500 migration files). This way we need is to write a test runner. By default, Django use the DiscoverRunner, we are just going to inherit from it and change some of its behaviors. Firstly, we are going to disable all database-linked stuff. For that, we override setup_databases and teardown_databases methods and make them do nothing. Like that, it is already working… kind of. Indeed, all tests run by this runner will not trigger any databases creation. That’s great but as all tests will be run, all the integration ones will fail. At this point, we need to filter the list of tests to keep only unit tests. For that we need to override another method. 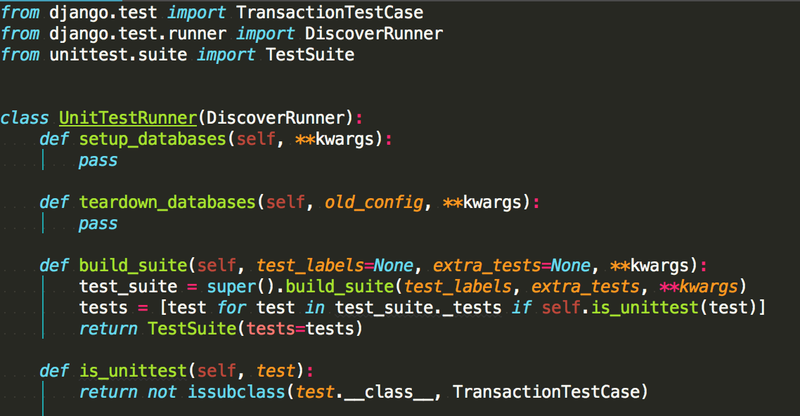 DiscoverRunner use build_suite method to create a TestSuite object that contains all the tests to run. Overriding this method allows us to perform our filtering. As TestSuite does not allow the removing of test, the solution is to create a new one with the filtered list. And that’s it, the runner is ready to be used ! The runner is now defined, but how do we use it instead of the default one ? Well, it’s quite easy. The Django test command accepts --testrunner option in which you can provide the desired runner classname. Given our UnitTestRunner is defined in unit_test_runner.py we can use the following command. It is also possible to change the default Django test runner by giving a value to the setting TEST_RUNNER . In that case, you’ll have to provide the default one to the test command when you want to run integration tests. The usage shown above can be tricky as we need to write a rather long command and we have to remember the path and the name of the runner. To simplify this, we define a command to “replace” test . We inherit from base test command and we force the testrunner value to our test runner. We can then run unit tests by running : python manage.py unittest . And that’s it, thanks for reading ! Software Engineer & team leader @OncoDNA, SA in Belgium. Love Django & Angular and project managing.